The Bike Cops for Kids community project was started in 2009 by a couple patrol level cops working in the Minneapolis public schools. With the help of three private funders, some awesome supervisors and a couple Chiefs along the way who shared their vision, the project became a huge success and is now being replicated in police departments across the country. These updates are just a small look into a police/community initiative that aims to put good, and occasionally some not-so-good kids, at the front of the line to receive some positive police attention. It's working in a big way and every day we are helping make the future full of awesome grown-ups. Vinneo is a cool 8th grade student and an academic all-star. 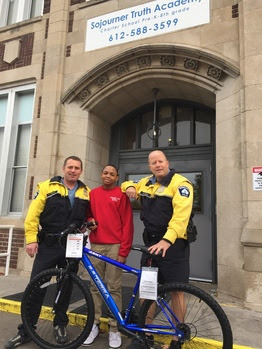 He was honored at an all school assembly and received a new bike compliments of MPD and the Bike Cops for Kids. The Fighting Chance boxing gym at 1704 33rd Avenue North is stacked with kids, cops and awesome boxing coaches. 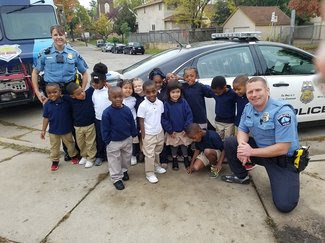 It's a regular stop for us on our beat and 4th Precinct coppers are constantly stopping in to connect with the kids. 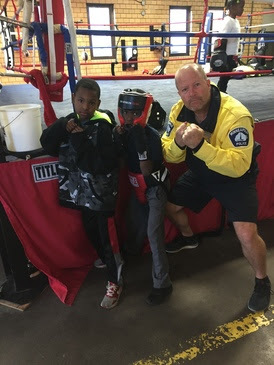 These two are a couple of Officer Mike's favorites, Jayshawn and Jaquon found an after school home here at the gym and they are doing exceptionally well with conditioning and sparring. Sergeant Herron joined Dave at Lucy Laney School for some fun reading time with the class of 2030. These high-5'ers are some very cool academic all-stars at the greatest school in North Minneapolis. 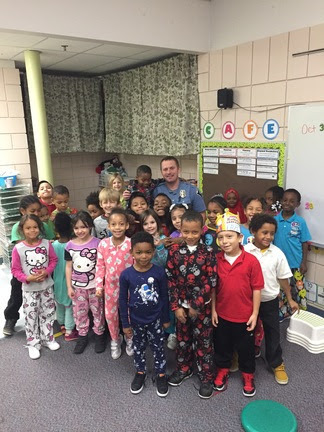 It was pajama day as we read some books to the kindergarteners and 1st graders at this Northeast elementary school. We even checked in with Officer Dave's wife and she reaffirmed that he came to work in his PJ's as well. Dave has three beautiful children at home just a bit younger than these students and it's his passion to read to kids like this all over the city.